During Barack Obama’s first hundred days, history has provided pundits and politicians with a grab bag of analogies. Obama himself has invoked Abraham Lincoln and put him on a pedestal. I’m not speaking figuratively: a bust of the sixteenth president sits on the same plinth in the Oval Office where Obama’s predecessor had displayed a sculpture of Winston Churchill. Obama has also cited Doris Kearns Goodwin’s Team of Rivals, an analysis of Lincoln’s complex relationships with leading members of his cabinet, as a model for his own style of presidential leadership. Journalists have compared the youth and idealism of Obama and his supporters to John F. Kennedy’s Camelot, and fashionistas have twittered about the dashing Michelle being a latter-day Jackie (with sinewy biceps). Still others have suggested that Obama embodies Reagan’s charisma while reclaiming Reaganesque paeans to national greatness for the Democrats. A few wags have tried to burst the bubble of hope by comparing Obama to Jimmy Carter, another Washington outsider and intellectual who promised sweeping change but whose mandate collapsed under the weight of recession, malaise and crisis in the Middle East. Barack Lincoln. Barack H. Kennedy. Barack Carter. Barack Reagan. None have captured the imagination of editorialists, bloggers and journalists like Barack Delano Roosevelt. A recent New Yorker illustration portrayed the forty-fourth president chin up in the Rooseveltian fashion, exuberant and self-confident, a cigarette holder clenched in his teeth. In this version of history-as-analogy, Obama’s fight against the “Great Recession” will restore a faith in government that has been wholly discredited by the disastrous policies of George W. Hoover. Obama’s most fervent supporters hope that the president’s stimulus package and ambitious budget will launch a “new New Deal” designed to restore confidence in the financial system, curb unemployment, revivify the housing market and rebuild America’s decaying highways and schools. The Obama-Roosevelt analogy is compelling–until you remember that history does not repeat itself. It is not cyclical. And it seldom offers easy lessons for the present. Ultimately, the differences between FDR and BHO and their respective eras are as instructive as the similarities. Each generation has drawn its own lessons from the New Deal. The first wave of New Deal histories were written by unabashed Democrats during the 1950s and early 1960s, when liberalism seemed invincible. The eminent historian and Washington courtier Arthur M. Schlesinger Jr. popularized the heroic interpretation of Roosevelt with a triple-decker history in which the New Deal represents the full flowering of an American political tradition of strong executive power and visionary leadership rooted in the Age of Jackson. FDR created the modern American state, offering a pragmatic, humane alternative to the radical individualism and anti-statism that had long hindered the fulfillment of the American promise of equality and opportunity. By the 1960s, however, the New Deal was under siege from various quarters. Left-leaning scholars, alienated by liberalism’s hubris, skeptical of military-industrial Keynesianism, outraged at the Vietnam War and inspired by radical insurgencies at home and abroad, argued that the New Deal was fundamentally conservative. FDR’s cardinal sin was that he saved capitalism from itself rather than taking the opportunity to nationalize the financial system and redistribute wealth. He transformed the state into the servant of big business, letting corporate executives and financiers draft legislation that allowed them to consolidate power, while he co-opted radical social movements with symbolic gestures. Conservatives rejoined with their own demonology of the New Deal. In a view that trickled down from the National Association of Manufacturers and the National Review and was distilled into the bitter libertarianism of Barry Goldwater and his followers, the New Deal was the epitome of collectivism, a dangerous repudiation of the founders’ ethos of governmental restraint, budgetary parsimony and states’ rights. Innovations like federal jobs programs and Social Security threatened personal liberty by turning citizens into dependents. More recently, in The Forgotten Man, Bloomberg financial columnist Amity Shlaes resurrects the Goldwaterite reading of the Roosevelt years, arguing that the New Deal sapped the vitality of the free market and–in her most hyperbolic moment–that “government intervention helped make the Depression Great” by dampening competition, over-regulating business and coddling the common man with make-work programs rather than unleashing his entrepreneurial spirit. For the past forty years, however, most conservatives have reserved their criticism of the New Deal for corporate boardrooms and think-tank seminars. One reason for their silence was political pragmatism. The right had little to gain by publicly thrashing a president whose memory was held dear by the blue-collar whites whom Nixon, Reagan and the Bushes assiduously courted. The war on poverty, black power, the counterculture, feminism and the sexual revolution made for more convenient targets. But as Republicans fought the culture wars, conservative activists captured executive branch agencies and the federal courts, chipping away at welfare, Social Security and scores of federal regulations. The strange result was that while Ronald Reagan once claimed FDR as a personal hero, his wing of the Republican Party gutted liberalism. At the dawn of the Age of Obama, the heroic, liberal Roosevelt is back in fashion. The front tables at bookstores groan under the weight of massive biographies of the thirty-second president, among them jailed financier Conrad Black’s surprisingly favorable Franklin Delano Roosevelt: Champion of Freedom and Jean Edward Smith’s widely praised and magnificently written FDR. A new addition to the pile is another sprawling account, Traitor to His Class, by the prolific University of Texas historian H.W. Brands. The prospect of plowing through another full-scale biography of Franklin Delano Roosevelt is daunting, especially when it offers few revealing or novel insights into FDR’s life, his pre-presidential career, the New Deal and World War II. Predictable, yes, but Traitor to His Class is reliable and compulsively readable. Brands writes in the vein of FDR’s earlier, liberal chroniclers: his is a mostly favorable account of Roosevelt’s career, with an emphasis on the dramatic turning points in the Depression and war, and on the president’s leadership style. But the Roosevelt who emerges from Brands’s book is less a rebel against privilege than a humane and ultimately pragmatic politician, one whose bout with polio spurred him to greater sympathy with the downtrodden but who was scarcely a radical, despite his occasionally fiery antibusiness rhetoric. Like many elites, especially from his home state of New York (including many who enthusiastically joined the ranks of New Dealers), FDR combined a sense of noblesse oblige with a faith in the application of expertise to solve pressing social and economic problems. Roosevelt may have dramatically expanded the size of the government and its public spending, but his programs were seldom as large in scale or as revolutionary as they first appeared to be. 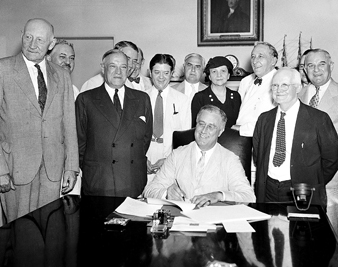 The New Deal did not centralize governmental power as its critics had feared it would; it left the administration of the most important relief efforts–unemployment insurance, old age assistance, aid to dependent children and job-creation programs (the Public Works Administration excepted)–in the hands of state and local officials who used federal funds as a form of local patronage and who often shunted aside politically marginal groups like African-Americans. Roosevelt’s populist rhetoric was belied by his administration’s close collaboration with big business. His Social Security Act was a two-tiered program that provided generous benefits for the elderly but was penurious toward unmarried mothers and their children. His housing programs excluded minorities and disadvantaged central cities. And his most long-lived work programs lasted less than a decade. As historian Alan Brinkley recently argued, “the New Deal has often seemed as significant for its failures and omissions as for the things it achieved.” Brands’s biography would have been more powerful had it paid more attention to FDR’s failures and omissions. Roosevelt’s lack of convictions (other than a sense of urgency to address the Depression) was remedied by his ability to delegate policy-making to what he called a “factocracy,” a talented and unorthodox group of advisers, many of whom had little experience in Washington. Through artfully drawn vignettes of budget director Lewis Douglas (the one Washington insider), confidant Raymond Moley (a Columbia economics professor), Wallace (who edited his family’s farm newsweekly), Perkins (a longtime advocate for working women) and public works administrator Harry Hopkins (a social worker), Cohen compellingly conveys the extraordinary sense of possibility in Roosevelt’s administration, even in one of the bleakest moments in American history. Roosevelt’s first hundred days were unprecedented in their scope and ambition. Barely settled in the White House, his administration stabilized the nation’s collapsed financial system. He repealed Prohibition–in an act that enhanced his popularity and stimulated at least one vital sector of the economy. Altogether he signed fifteen major pieces of legislation in just a little more than three months. Roosevelt created the Tennessee Valley Authority, a massive public works project meant to modernize the region’s economy. The newly minted Agricultural Adjustment Administration provided crop subsidies to farmers, regulating output and stabilizing prices in the deeply depressed agricultural sector (although privileging large farmers and seldom benefiting tenant farmers or farm laborers). His job-creation programs–the Federal Emergency Relief Administration and the Public Works Administration–dramatically reduced the ranks of the unemployed and stimulated the economy by building roads, libraries, post offices, hospitals and schools. And through the National Industrial Recovery Act–the most controversial and least effective of these first programs–the Roosevelt administration instituted central economic planning, promoting a novel collaboration between business and government. For good reason, Cohen is most sympathetic to Roosevelt’s job creation and public works programs and their advocates–Perkins and Hopkins. His most sensitive portrait is of Labor Secretary Frances Perkins, the first woman to serve in a presidential cabinet. Through a detailed account of her career, Cohen captures the humanitarian and reformist impulses that coursed through the New Deal. A witness to the infamous Triangle Shirtwaist fire of 1911, a crusader for minimum-wage and hours laws, an idealist but also an astute political operative, Perkins used her cabinet post to lay the groundwork for the New Deal’s staunchly prolabor policies. For the first time, the government allied itself with organized labor and working people–an alliance that Southern Democrats and probusiness Republicans would assail in the 1940s but that was arguably the New Deal’s greatest contribution to mid-twentieth-century American prosperity. Cohen’s argument that Roosevelt’s programs were revolutionary, however, overstates the case. Most of FDR’s programs were inspired by similar local and state innovations in the early twentieth century, the expansion of regulatory powers under Theodore Roosevelt and Woodrow Wilson and the interventionist economic policies of World War I. FDR also expanded Herbert Hoover’s policy innovations. Cohen resuscitates the hoariest clichés about the Hoover administration as the last bastion of laissez-faire capitalism. To buttress his argument, he relies on the authority of one of Roosevelt’s most partisan biographers, Arthur Schlesinger Jr. It was politically expedient for Schlesinger to draw a bright line between Hoover and Roosevelt. And it was made easier by Hoover’s three-decade-long post-presidency–in which the bitter Republican spent most of his time railing against the New Deal. But Cohen discounts a whole generation of scholarship on Hoover that offers a far more nuanced portrait of his politics. Hoover was no libertarian. As secretary of commerce in the Harding administration and then as president, Hoover reorganized and dramatically expanded the federal bureaucracy. He stepped up antitrust enforcement–in contrast to FDR, who jettisoned antimonopoly politics while gesturing to it in his occasional denunciations of greedy business leaders. Hoover also created the Reconstruction Finance Corporation and signed the Federal Home Loan Bank Act, which restructured mortgage markets in an effort (that FDR would expand) to promote homeownership and spur the construction industry. The Tennessee Valley Authority grew out of Hoover-era public works projects, most notably the massive Boulder (later Hoover) Dam project. None of these programs were as ambitious as their New Deal counterparts, but they grew from the same Progressive roots that nourished Roosevelt’s initiatives. The political philosophy of Roosevelt’s first hundred days was anything but coherent. The new administration mixed fiscal conservatism, central planning, large-scale government spending and public-private partnerships, localism and states’ rights. Its successes were the result of experimentation, but so too were its failures. For example, Douglas, much more of a budget hawk and small-government advocate than Hoover, pushed through the Economy Act of 1933, which dramatically cut government spending, and in the process undermined the stimulative effects of Roosevelt’s public works and jobs programs. Fiscal restraint characterized even FDR’s most ambitious spending programs. None of the public works and job-creation programs of the early New Deal were sufficient to lower national unemployment rates below 10 percent. They stimulated modest growth–but together were not substantial enough to pull the country out of the Depression. FDR was so beholden to the principle of balanced budgets that in 1937 he dramatically cut federal spending and caused a devastating downturn. It would take the massive spending of World War II–still the most convincing demonstration of the power of Keynesianism to date–to reinvigorate the economy. To note the limitations of the New Deal should not diminish its accomplishments. The legacy of the New Deal is inescapable: think of our post offices, bridges, highways and national parks, many of which began falling into decrepitude in the late twentieth century when Republicans axed domestic spending. Roosevelt and his successors failed to enact national health insurance, but they dramatically increased access to medical care through a massive hospital-building program. The programs launched in the first hundred days ended up delivering electricity to large parts of the United States, bringing the South into the First World. The New Deal’s most important legacy, one hard to quantify, was that it transformed the relationship between citizens and the state, with enduring consequences. The New Deal launched a rights revolution–one embodied in FDR’s calls for an expansive “economic bill of rights” that included decent housing, remunerative work and security in old age. FDR’s increasingly capacious sense of political rights was in part the outgrowth of innovative policy-making in the executive branch. But as historians like Lizabeth Cohen and Meg Jacobs (authors of important books on consumer politics) have shown, the New Deal was not simply developed and administered from the top down. It also sprang from political organization, grassroots mobilization, petitions, protest and disruption, or the threat of it. You wouldn’t know this from Brands and Cohen, whose books share a weakness common to many presidential biographies. They offer rich insights into the life of Roosevelt and his advisers but relatively few glimpses of the times. The vast majority of Americans–the quarter of the population unemployed in early 1933, the masses lined up to recoup their money at failing banks, the wretched refugees of the Dust Bowl–appear mostly as passive bystanders, victims waiting to be saved by a heroic president. They listen to FDR on their radios, they write moving letters to the White House, but they are not the agents of change. At best, both books give cameos to the Bonus Marchers, those World War I veterans who marched on Washington to demand that the country reward them for their sacrifice. Cohen devotes a paragraph to the pitchfork rebels of Iowa who rioted to protest foreclosures in 1933, leading to the imposition of martial law, and who had counterparts in nearly every rural area of the country in the early 1930s. The authors give a nod to the influence of militant labor activists. But their accounts downplay the firebrand leftists who gathered tens of thousands in mass demonstrations in nearly every big city; the unionists who used the economic dislocations of the Depression to organize workers to challenge corporate greed and demand workplace security; the millions of blue-collar workers, many of them immigrants and their children, who joined unions; and the urban blacks, fired up by FDR’s promise to deliver them from poverty but outraged at the persistence of discrimination, who boycotted stores and who grew increasingly restive as the United States entered World War II. Our history of the New Deal is woefully incomplete with these folks cast as extras in the drama of presidential politics. FDR’s sense of urgency was not simply bred by his political genius, his leadership style or his personal experience. All of those mattered–they made him receptive to external pressure and, unlike Herbert Hoover, sympathetic to the plight of the “forgotten man.” But the policy experiments of the New Deal were also the result of fear of upheaval and, later, concerns that radicals, whether communist or fascist, whether followers of Huey Long, Francis Townsend or Charles Coughlin, would prevail. Whether Obama can tame the Great Recession, whether his mostly seasoned, Clinton-era circle of advisers will boldly experiment, and whether his presidency will ultimately be compared favorably with Roosevelt’s, remains to be seen. It pays to recall that the New Deal was the result of presidential leadership and policy innovation, but also that the drama of the Great Depression and the New Deal played out in places far from the nation’s capital–on New York City’s streets, in Nebraska’s cornfields, in Flint’s auto factories and in California’s shipyards. Perhaps the biggest difference between 2009 and 1933 is that Obama has not, at least yet, been seriously tested by organized pressure from below. That might ultimately be what distinguishes FDR’s administration from Obama’s.